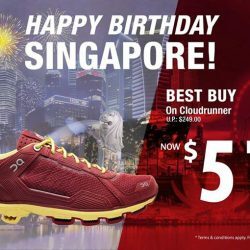 Running Lab Great Singapore Sale is here! Running enthusiasts, don't miss this sale to get 15% off when you buy 2 items and 20% off with 3 or more items purchased! Sale ends 30 June 2018. Time for new running gears? 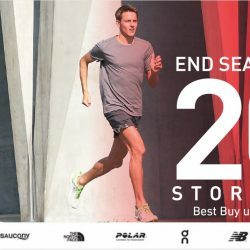 RUNNING LAB END SEASON SALE IS HERE! Enjoy 20% OFF STOREWDE* on regular-priced items! Many attractive buys at up to 50% off as well! Brands include Asics, Saucony, The North Face, Polar, New Balance and more. Promotion valid from 30 Sep - 9 Oct 2016. *Terms & Conditions apply. Check in-store for more details. 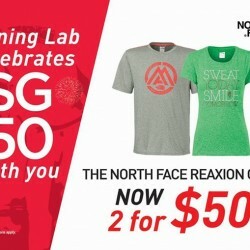 In celebration of Singapore's 51st birthday, Running Lab is having a special $51 promotion! On Cloudrunner in Tibetan Red is now at a special price of $51 (usual price $249)! Promotion starts now and ends 14 Aug 2016 or while stocks last. Mai tu liao! Hurry come and chope yours today at only $51! Join us at the On Singapore City Race Race Expo! 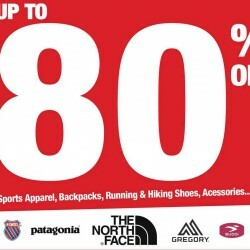 Get great buys at UP TO 60% OFF on Gregory, The North Face, On Running Shoes, Patagonia and many more sports and outdoor brands! 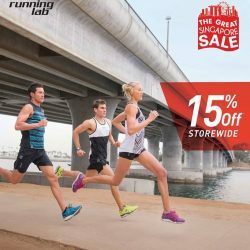 Receive 15% OFF STOREWIDE* at Running Lab Marina Square, Novena and Westgate outlets! Kick off the Great Singapore Sale at Running Lab! 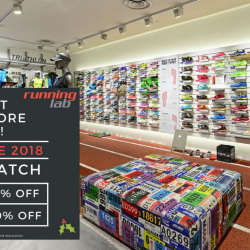 Irresistible offers at Running Lab this End Season Sale, not to be missed! 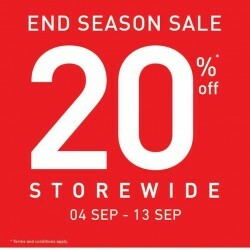 Enjoy 20% off storewide and up to 60% off Best Buys! Promotion from now till 29 Feb 2016. Terms & Conditions apply. While stocks last. Head to Running Lab's Warehouse Clearance Sale this weekend to grab new sports apparel! Definitely a sale which you want to come running to. 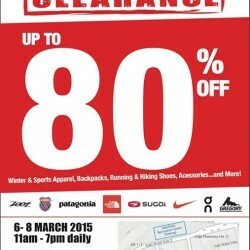 Get up to 80% off retail price for top sporting brands such as The North Face, Asics and more! Check out our tips to survive a warehouse sale before going down! 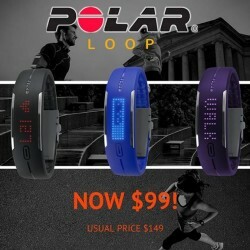 Polar Loop at $99! Promotion while stocks last so hesitate no more! Polar Loop is an activity band with smart guidance! Stay motivated by tracking your activity around the clock. Waterproof tracker to monitor sleep, track calories and count steps. 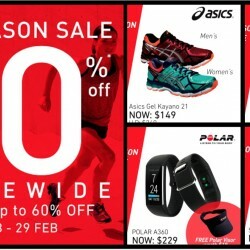 Running Lab brings you 20% OFF season sale. Hurry down to our Running Lab stores during this long weekend to grab your running accessories, footwear, apparels and more. 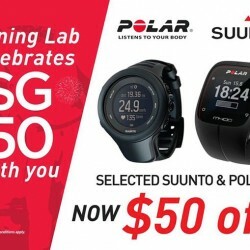 Enjoy this Running Lab celebration SG50 with you! and enjoy $50 OFF for POLAR A300, M400 & V800 models! Or enjoy $50 OFF for any watch from Suunto Ambit 3 series! from now till 10 Aug 2015. While stocks last!Term and conditions apply. Running Lab celebrates SG50 with you! The North Face Reaxion short sleeve and sleeveless t-shirts are at 2 FOR $50 from now until 10th August 2015! Terms and conditions apply. This is going ON now & it will end ON 31 Mar 2015! Grab this chance and try a pair on ON Running shoes at any of their stores! Upon trying it out with a simple walk or jog on the treadmill, you will receive a 15% voucher which can be used for any regular-priced item available in stores. SPORTS WAREHOUSE SALE HAPPENING THIS WEEKEND! 6 to 8 March 2015 (Fri to Sun)! Come on down to 17 Kaki Bukit Crescent & enjoy great discounts at the warehouse sale! 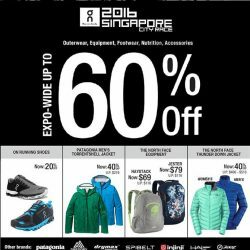 Products ranging from sports apparels, accessories, footwear to hiking apparels, jackets, bags and many more! Share this good news with your friends! 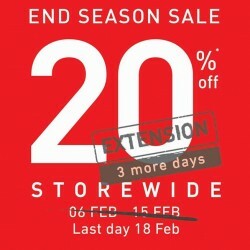 Great news for those who missed their 10 day End Season Sale! They have extended their storewide promotion & other special promotions till 18 Feb 2015 (Wednesday, CNY Eve)! Time to get new running outfit and gears at Running Lab! Get Free Balega socks (worth up to $23) with minimum net spending of $88 in a single receipt! 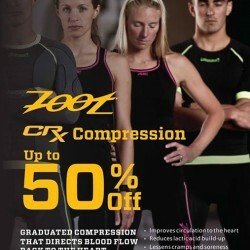 Zoot CRX Compression now at up to 50% discount! Head to any Running Lab store today & give it a try! 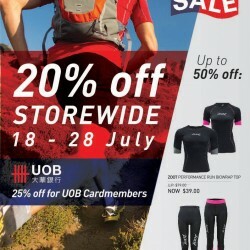 20% off Storewide, and an exclusive 25% off for UOB cardmembers! 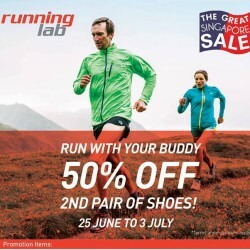 Whether you are getting your pair of spare running shoes or you are planning to run with your buddy, get 50% off the second pair of shoes purchased at all Running Lab stores! Along with other exciting promotions like $59 for 2 T-shirts from The North Face! Promotion ends 3 July 2014. While stock last at all Running Lab stores.